Every so often, I have to stop and breathe and reassess where I am and what I have to do. I write full time now, and have been doing so since April. I am able to write more, definitely, but I also take on more than I would have when I was working a day job. Sometimes I must remove items from the list. 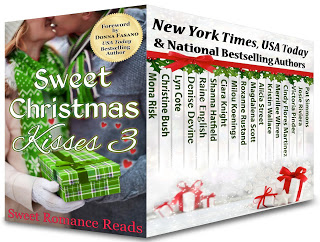 For instance, I’ve contributed a Christmas novella to the Sweet Christmas Kisses anthology for the past two years. This year, I’ve had to accept that I won’t be able to write a Christmas novella. I have other commitments to keep. But I still regret not getting it done. Thus far, this year, I’ve completed one book for my publisher, Lake Union, and have almost completed the second book in our contract. Two books in one year—that’s much faster that I used to write, so that’s to the good. But I am also going to a conference—RomCon in Denver—this month and there’s preparation to be done for that, including things like making new bookmarks to hand out, and finding other nifty promo items. We are even leaving a few days early to do some sightseeing in the Colorado area ahead of the conference. Meanwhile, as I said, I’m closing in on the end of a solid draft of the second book and I’m eager to send it to my beta readers prior to leaving on my trip. Lots of busy juggling happening here, and I haven’t even started packing! If you’re a reader or an author (or both) and attending RomCon in Denver, I hope you’ll say ‘hello’ to me there and if you have any insight on how to better optimize my time, I’d love to hear it! I’m not contributing to this year’s Sweet Christmas Kisses anthology, but seventeen other wonderful Sweet Romance Reads authors are, so be sure to get your copy. These are fabulous stories and a fantastic deal at any price, but most especially at the sale price of 99 cents! Best wishes, Grace. Enjoy RomCon and Colorado! Happy that you're writing full-time, more great stories to read!! I love reading your books, and as an author--you inspire me! Enjoy the conference. Thanks so much, Rita! Reader-writer conferences are so much fun!! That is so true. And then, the unexpected happens and throws it all up in the air. Flexibility and time management is the key, I guess, but I'm not really good at either.